Your wedding is one of the most unforgettable days of your life, so have your wedding ceremony in an equally unforgettable location! Distinction Te Anau Hotel and Villas is located on the shore of Lake Te Anau and surrounded by the majestic ranges of the Fiordland ‘World Heritage National Park’, providing a stunning setting for your wedding ceremony. Choose from our Lakeview Chapel, the only wedding chapel on Lake Te Anau or our stunning outdoor location Lakeview Lawn overlooking Lake Te Anau, you will be spoilt for choice. 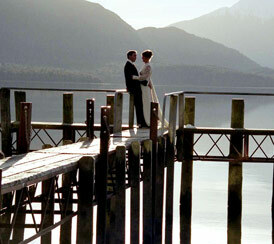 Distinction Te Anau Hotel and Villas offers the only wedding chapel set on the lakefront of Lake Te Anau. The chapel has the capacity to accommodate 80 guests sitting and 20 standing. Surroundings of glass, picturesque views of Lake Te Anau and the Fiordland Ranges the Lakeview Chapel is everything you dream of and more. Whether it is an afternoon wedding where you can see all of the chapel’s beauty in the sunlight, or an evening wedding trying to catch the breathtaking sunset in the background, there has never been a more romantic chapel exclusively set for weddings. Breathtaking views from both inside the Chapel and the surrounding grounds make for a multitude of superb wedding photography opportunities. Say “I do” on the manicured lawns in front of the Distinction Te Anau Hotel and Villas. Lake Te Anau and the Fiordland National Park Ranges form a stunning backdrop for your exchange of vows. This breathtaking setting on the shore of Lake Te Anau is the perfect venue for an outdoor wedding. Given the unpredictable nature of the climate at Te Anau, a wet weather option is always required as back-up for your outdoor ceremony. For ceremonies with up to 40 guests the Private MacKinnon Room can be closed off for a private and intimate ceremony. For larger gatherings the Lakeview Wedding Chapel can seat 80 guests and 20 guests standing. Note: If your outdoor ceremony was not to be held at Distinction Te Anau Hotel and Villas a charge will apply for the indoor ceremony venue. If hot weather is forecast, think about supplying cool drinks for guests waiting in the sun. This can be organised through Distinction Te Anau Hotel and Villas for a nominal fee. Contact us for more information on any of the above options.